In Memory of Jo Cox MPSend in political videos from your smart phone! It was a mild mid-summer evening as I stood at the entrance to a municipal office building in Euston and pressed the buzzer for a second time. The intercom remained silent. Beside me hovered a young man in his twenties, denim jacket, high-top trainers ‘Are you here for phone banking too?’ I asked. ‘Yeah’ he replied. It was June, Britain still enjoyed the confidence of Europe and Momentum, the campaign group around Jeremy Corbyn, had rallied members to canvass for Remain. The door opened and a tall, elegant brunette in a jumper dress stood before us. It was quite a surprise when, in a voice deeper than the guy beside me, she asked ‘Are you here for phone banking?’ ‘Yes’ I nod, a little taken aback. ‘Great. I’m Clare’. We follow her up the stairs and in seconds, Clare has shown us how to use the app. The shabby office is host to around thirty people, all trying to convince the British public to stay in Europe. I pour myself a plastic cup of water, peel a complimentary tangerine and begin the task in hand. At this point, I had no idea how much time I would be spending, nor emotional energy I would be expending, in this thirty-foot patch of regulation fire-proof carpet. But ten days later, the space where fellow phone bankers sipped tea and smiled reassuringly, had become like an emergency room in A&E. Shadow Cabinet resignations, dramatically announced like orchestrated cluster bombs, signaled a coup was being mounted and a great many of us rushed to help. Accusations of incompetence were circulating; the mantras ‘unelectable’ and ‘not a leader’ repeated constantly. It was like a tidal wave had hit a fishing boat and everyone was spltuttering for air. ‘How on earth are we going to win this?’ I asked Clare, hot desking beside me in the midst. Her powdered green eyes fixed firmly on her screen, ‘We’re going to win’ she replied, stern and resolute. And as I looked around the office, I saw huddles of young people, some no more than eighteen years-old, rebounding attacks through Facebook memes and carefully composed tweets. 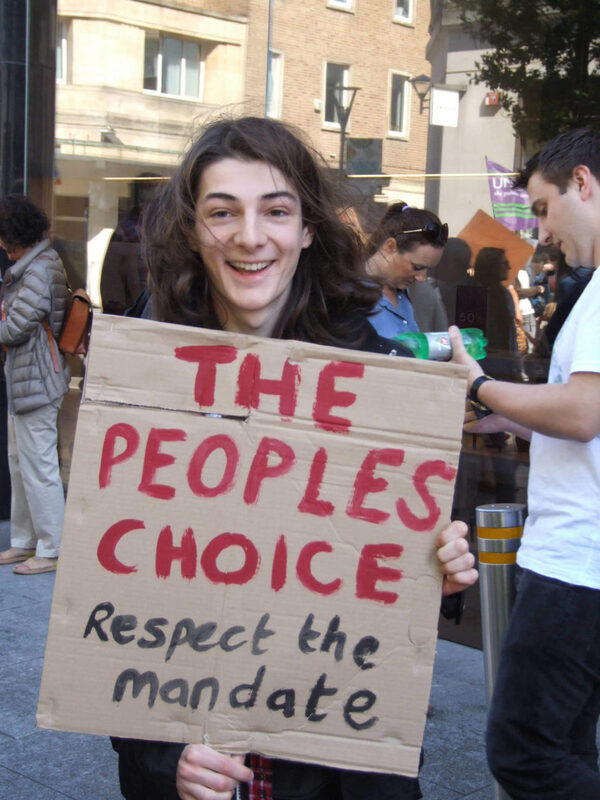 Henry, spectacled and awkward, a recent Oxford graduate and Momentum volunteer, was condensing the findings of an in-depth pro-Corbyn report into less than twenty words. During those dark days, Momentum’s social media reach stood at 11.7 million hits a day. And then something extraordinary started happening. 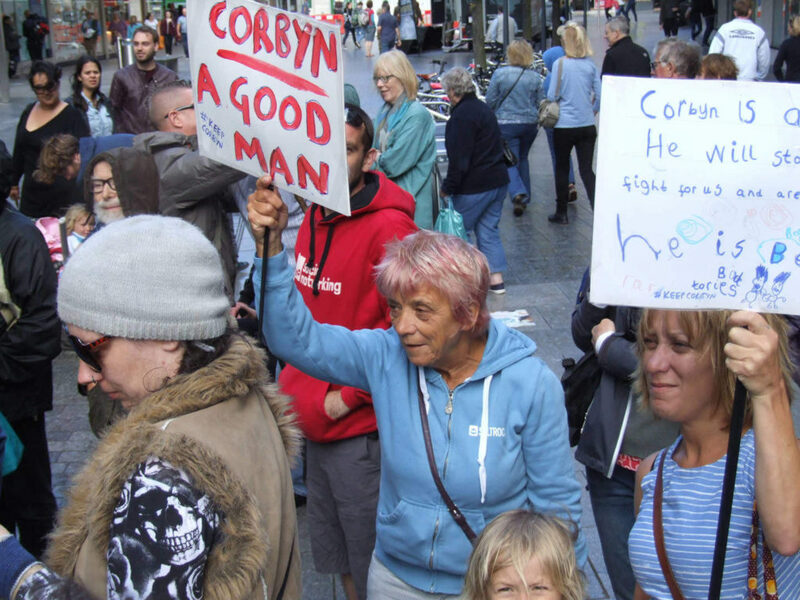 At very short notice, sometimes seventy-two hours, sometimes twenty-four, mass gatherings were being held across the country in support of Corbyn. Suddenly, I was on the phone to Momentum members in Leicester, Coventry, Newcastle, Manchester, Liverpool begging them to film these events, photograph them – anything that would record these extraordinary times. From Glasgow to Penzance, Momentum held rallies in town centres, public meetings, marches through the streets. Often venues would need to change last minute as the assembled crowd was too big. 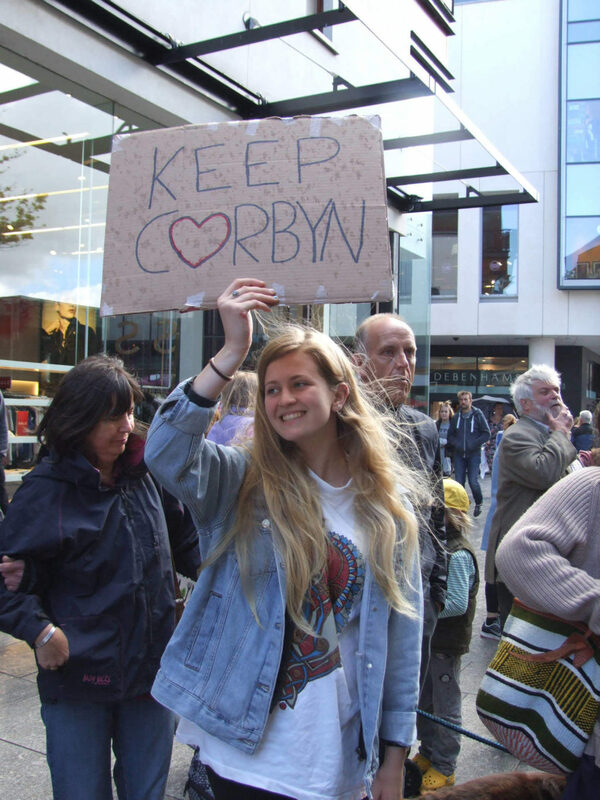 In the small market towns across Britain, port towns, old industrial centres, people raised their voice in unison and chanted ‘Corbyn In, Tories Out’. These were not members of a cult. They were active and politically engaged Labour voters who want an end to Conservative policies that are damaging their lives. I’m on the phone to Sarah in Exeter. Her accent’s from the north but down south is where she’s made her life. Local radio will be interviewing her about a rally the next day and she’s nervous. Sarah is very much the typical Momentum member I encountered; mid-fifties, wife, mother, nurse, Labour roots right up the family tree. The conversation moves on. We start to talk about how we feel. ‘I’ve been a lifelong Labour supporter’ she tells me ‘and Corbyn represents my values. It’s the first time I’ve felt like this about the Labour Party in years. Now they’re trying to get rid of him and it’s like something is about to die’ I agreed. The muted panic of impending loss hung over all of us. But it wasn’t Corbyn. It was our renewed hope that Labour might once again mount a credible opposition, represent core voters, the silenced and the young. 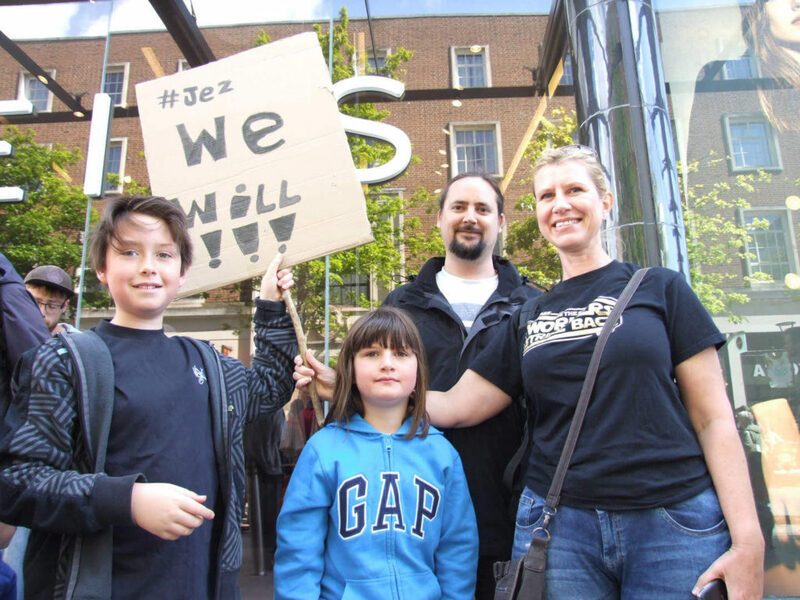 The next day, two hundred and fifty people turned out in Exeter town centre. Sarah was ecstatic. At seventy-two hours notice in a rather conservative town in the South West of England, this was a triumph. Members of Momentum Exeter invited those assembled to write pledges of support. The messages were simple and unpretentious ‘We’re behind you, please keep going’; ‘For the first time in my life a politician that speaks for me’; ‘Stay left, Stay Corbyn, Stay kind’; ‘Now we need change not factions, let’s be better than that’. After a hundred people wrote messages they ran out of pledge forms and had to go and print some more. 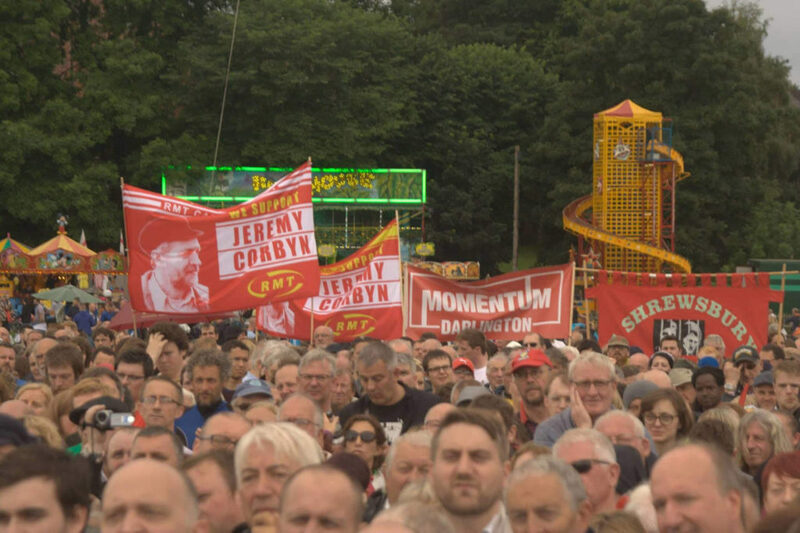 Videos and photos started landing in my inbox from other Momentum rallies across Britain. These were not the high-production images of crowds erupting in city after city, which we saw during Corbyn’s re-election tour that summer. Instead, they were scratchy video recordings taken jerkily on mobile phones and snapped photos from within the throng. But their impact was no less powerful. In the ten days after Hilary Benn expressed no confidence and triggered a coup, over thirty thousand people across Britain had turned out for Corbyn. The organisers I spoke to were astonished. Dawn from Momentum Cornwall couldn’t believe it when a hundred and sixty people gathered in Penzance, ‘It’s a very small town. When we do events we expect around fifty.’ In Hull, five hundred attended a public meeting, some for the first time. Gary reported it as one of the biggest political meetings for many years ‘This is a battle for the future of the Labour Party and ordinary members must win’ he told me forcefully during a conversation over the phone, ‘There is no support in Hull for a coup against Jeremy’. Sixty-thousand people joined the Labour Party that week. By mid-July, it had risen to a hundred and twenty thousand. Now I had these photographs and videos, what was I going to do with them? I decided to consult with Santiago. Although only twenty-four, Santiago emits the wisdom of an elder. Surveying the flows and currents of the office floor, he smiles as I sit down beside him at his corner desk. ‘Santi, I need filmmakers,’ I begin. ‘We’ve got those’ his words trip lightly and before I know it, an email call has gone out to Momentum members asking filmmakers to get in touch. From across the country, editors, directors, camera men, camera women, animators, sound technicians, actors, poets, composers – you name it – took up the call. Off-shoots of Momentum had already popped up all over the place: Momentum Arts, Momentum Kids, Momentum Women, Momentum Rock & Roll Socials, Momentum Football and now my contribution, Momentum TV. I wanted to meet artists whose work reflected this burgeoning grassroots political movement. 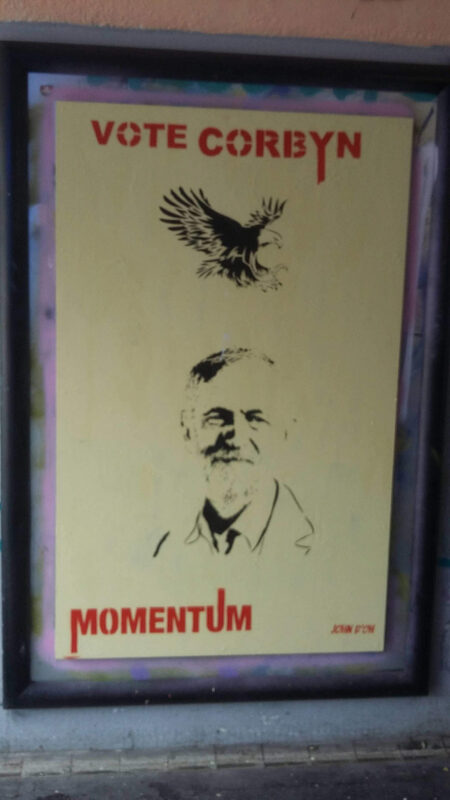 Down in Bristol, where Momentum groups design apps for mass online political engagement, I met John D’Oh, an unassuming West Country lad whose graffiti of Corbyn sprayed all the way from Weston-Super-Mare to London. On Brick Lane, we used it a backdrop for a poetry performance by up-and-coming Liverpudlian singer, Louisa Roach. As I went on to build Momentum TV, I heard repeated references to war and in particular, to the invasion of Iraq, so much so that it became the one unifying factor behind almost every Corbyn supporter I met. It was certainly the reason I was there. Like so many other Labour voters, I’d withdrawn after the invasion, consigned to watch neighbourhoods exploding, family traumas bleeding down through generations, the union jack fluttering from the masts of tanks while our moral influence and honour were collapsing in the rubble. Just up the road, a Momentum Hackathon was taking place, where coders looped up symbols in a marriage of technology with democracy. Outside, a propped up advertising board invited people in. I maneuvered my way past it to be greeted by Beth, nineteen and sprite-like, holding a packet of Frazzle crisps. She offered me one before asking if I’d like to join a group. Volunteer techies sat around in huddles discussing ways to engage more people in politics through digital learning apps and networks for community engagement. Beth’s eyes widen when I show her a picture of John D’Oh’s graffiti down the road. She adds the photo to Momentum’s Instagram and pledges to collect more. 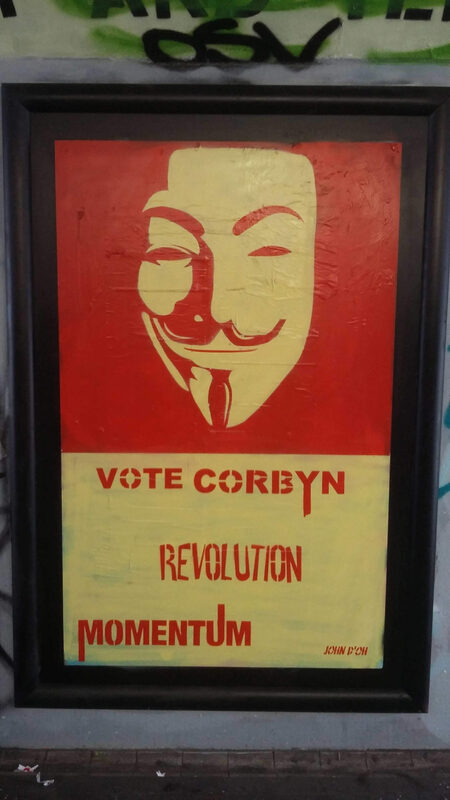 Graffiti of Corbyn was flashing up on walls and billboards throughout that summer. I tried to recall a political figure who had inspired so many renegade portraits – Che Guevara? Mandela? 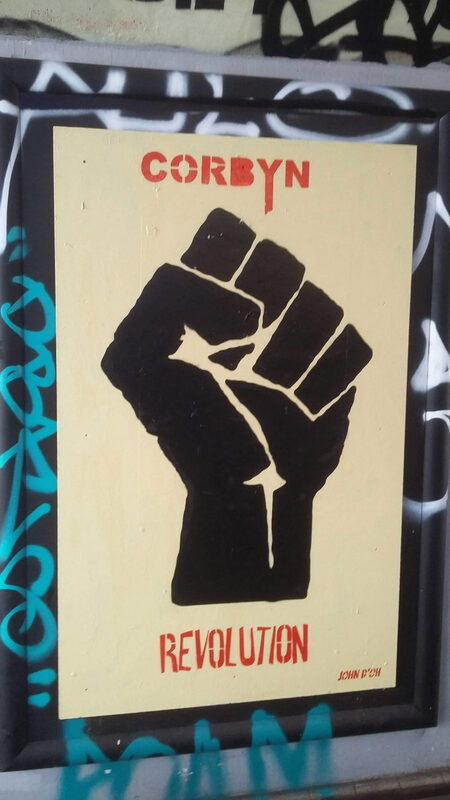 But it was not just rebellious graffiti art, it was also rappers, beat-boxers, DJs, musicians, singers; at times it felt as if the whole of creative Britain was behind the Corbyn leadership campaign. On stage at The Forum in North London, an old 1930’s Art Deco cinema turned Irish Dance Hall, and now a live music venue, Liam and I are watching Ken Loach speak about the deprivation many around Britain are facing. Liam is a video artist from East London and Momentum member who responded to the call out. On the mugs and t-shirts stall is Julie, a platinum blond forty-something from Liverpool. Her accent takes me back to childhood days spent watching episodes of BREAD on BBC. ‘I haven’t been able to go into work today’ Julie confides, ‘I’ve been that nervous’. Tonight the National Executive Committee of the Labour Party (NEC) will vote to decide whether Corbyn stays on the ballot in the re-run of the leadership election he fought and won with a landslide less than twelve months before. Up until then, I’d been pretty confident the Labour Party’s administrative body would resist moves to deselect him. Julie puts me right, ‘Most of those on the NEC are against Jeremy. If they can get him off the ballot then they will’. The panic that had consumed me during those first, uncertain days of the coup, returned. Lost for what to do, I bought Julie a pint and hurried backstage to find Liam. Speakers and performers sat awkwardly on uncomfortable chairs nibbling cheesy crisps and drinking warm beer. It was a world away from cocktail parties in resplendent rooms. Ken Loach sat in one corner, perfectly comfortable being accosted by Liam and others for whom he is a hero. The big guns had turned up: McDonnell and Abbot, a little later, Corbyn too. Heavy regional accents permeated the room as Union men discussed the impending outcome of the NEC vote. At the front of the stage a cheer goes up. Mark Serwotka, General Secretary of the Public and Commercial Services Union has just announced the results of the NEC ballot. Corbyn stays on by one vote. I push through heavy fire doors in time to see the audience clapping, whooping, standing up. On their faces is relief, others elation, and I note again the mixed palette of races, angled jowls of poverty on some, plump fresh cheeks on others, sunken eyes betraying troubled minds, smiles flushed with cheer and hope. In a wheelchair a man in bifocals roars with victory at the prospect life may get a little better. 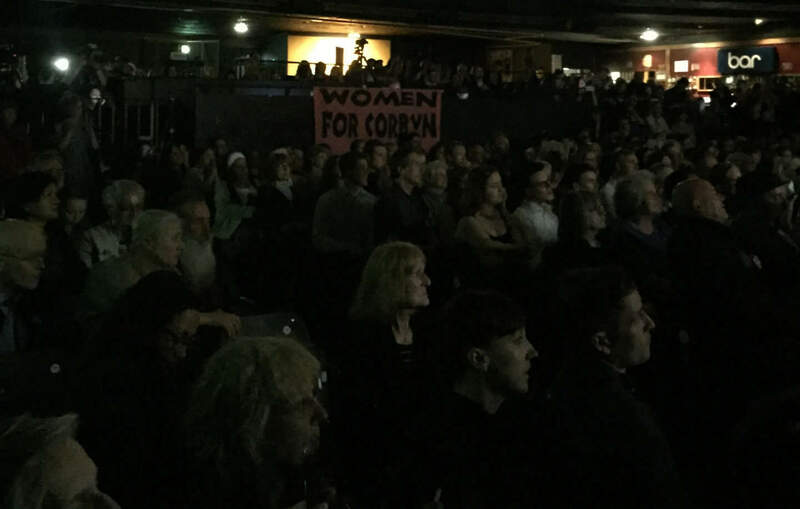 Draped across the mixing desk in the centre of the crowd a banner reads, ‘Women for Corbyn’. Collectively we cherish the moment as winds blow momentarily in our favour. Two days later, Labour donor, Michael Foster, submits a legal challenge to overturn the ruling. So began ‘The NEC Sagas’, a string of dramatic moves that were widely interpreted as attempts to diminish Corbyn’s support within the Labour Party membership. Around this time, the NEC excluded a hundred and thirty thousand Labour Party members from voting in the leadership election. It then opened up a forty-eight hour window for people paying £25 to sign up as registered voters and participate in it. Momentum’s social media team were on fire. ‘£25 All Votes Must Go!’ declared one Facebook meme against an image of frenzied Black Monday shoppers. ‘For a world where people can’t buy votes’ cried another, ‘Democracy shouldn’t have a price tag but we can’t afford to lose this’. A hundred and eighty thousand people signed up during those forty-eight hours, the vast majority of whom backed Corbyn. But then the exclusions started, and it wasn’t a fair fight anymore. Some were undoubtedly justified. 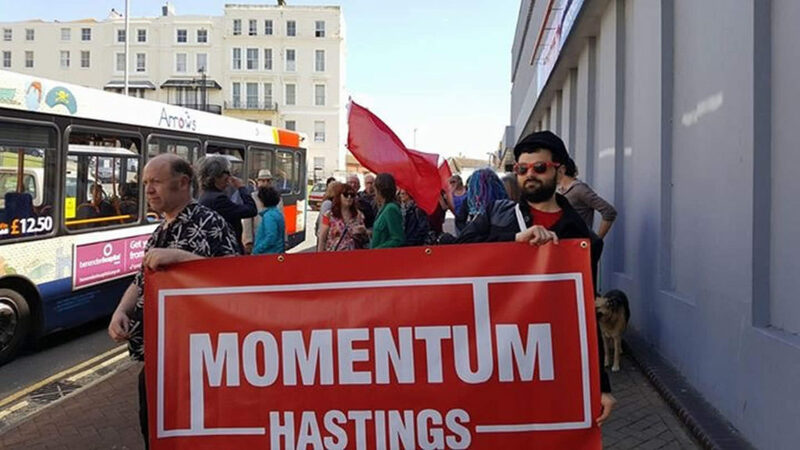 Members of other political parties cannot join Labour and, as Momentum would discover to its detriment some months later, concerns around the disruptive influence of hard left activists are real. However, the people I encountered were long standing party members, Labour councilors, some excluded for infractions as minor as sharing a Green Party tweet. While the NEC combed through members’ social media accounts, the polls closed on 21st September with sixty thousand people still waiting for their ballot papers, including my own mother. Back in the Momentum office, I meet Katie in the lift. ‘How’s it going?’ I chirp. ‘Don’t ask’ she sighs and rolls her eyes, dark pockets of anxiety beneath them ‘I’ve had the worst week of my life’. Katie is another recent graduate, nervous and rotund, she suffers from epilepsy and is entirely dependent on the NHS for medication. ‘I don’t know what I’d do without the NHS’, she admits, running agitated fingers through knotty straw-blond hair as we stand together on the balcony some days prior. Katie visits picket lines in solidarity with Junior Doctors and writes about it on her Facebook page. She’s also in charge of merchandise, or was, until a mole exposed the story of the t-shirts. Masquerading as a volunteer for five weeks, Mohammed, which we later found out was a fake name, was in fact a reporter for The Mail on Sunday. As the lift ascends, Katie tells me about the panic-attack she had when the story broke, ‘I couldn’t breath’ she tells me plainly. Allegedly, the t-shirts Katie bought were made in Bangladeshi sweat shops. ‘They advertised as an ethical company’ Katie’s face, usually as bright as winter sun was overcast with pain ‘and I made sure we did the printing here in England’. She tails off defeated, looks away, ‘I never want to see another t-shirt as long as I live’. I saw changes to Momentum after Mohammed the mole had left. An invisible drawbridge came up, anxiety and suspicion crept in where before there was only openness and trust. Perhaps naively, everyone had been welcomed. The three members of staff at Momentum worked without hierarchy or favour. When I began volunteering for Momentum, I had no idea who was permanent staff and who wasn’t. Everyone was just mucking in together. Behind me, I hear Faduma enter. As ever, swathed in brightly coloured material, her headscarf framing dazzling white teeth against smooth, brown skin. Most of the time Faduma’s smiling, except when her eyelids drop, her smile vanishes and she’s quite visibly and quite vocally pissed off. ‘If anybody else steals my volunteers’ she declares ‘I’m going to seriously tell them off ’. Volunteer Wars were a common feature of life at Momentum. Anyone with tangible skills would be co-opted by other teams, usually surreptitiously. Katie’s younger brother, Dougal, was helping me with Momentum TV and quite soon, I found myself fighting a Volunteer War with Justin from The World Transformed. Justin is tall, dapper, from Barnsley in Yorkshire and has teddy-boy hair. ‘Dougal can’t just not show up to a meeting, Justin, because he’s been given work by you’ I protest. Justin recoils before conceding with a sigh, ‘Okay, we can part with him for as long as you need him’. At sixteen, Dougal prefers working with the older boys anyway, so I’m fighting a losing battle and I know it. Relieved that’s over, Justin goes back to the screen of his dented laptop, from which he directs comms for The World Transformed (TWT), a festival of art, activism and grassroots voices that will run alongside the Labour Party conference in Liverpool. Momentum TV plans to profile artists and activists from its line-up and Ursula, another sassy young Oxbridge graduate, has offered to lead on it. Soon she and Justin are discussing logistics. As it turns out, they already know each other from the Occupy movement. The World Transformed was held at The Black-E in Liverpool, a mid-nineteenth century chapel turned community arts centre. Positioned on a hill leading up from redeveloped docks where the Labour Party conference would take place, the Black-E towered over like a Christ the Redeemer, its giant fluted Corinthian columns standing statuesque upon wide stone steps tread, over the course of the festival, by over four thousand visitors. On the third-floor landing of its wooden back staircase, a massive satirical poster condemning advertising hangs a few steps from Darren Cullen. Cullen is a Dismaland artist whose work questions the culture of consumerism that increasingly pervades British society. Outside on the steps, Ash from THTC Clothing explains how consumer choice can be redirected towards fairer conditions and better workers rights. Inside, the Fracking Nanas describe how they take their anti-fracking campaign to the Grandmothers of England’s shires. Artists in Residence, Alam Padam, chat to punters as they sketch. Beside them is the banner of campaign group, Global justice Now, who won their fight against the might of transatlantic corporations. A training session on public speaking is taking place downstairs. Huge and intricate banners hang like Coats of Arms from double-tiered balconies, some emblazoned with heraldry of Trade Unions, others weighted by the stitches of their intricately-sewn call to arms against injustice, discrimination and in support of better wages. I look around the space inside this grand, Victorian, high-vaulted chapel and I think to myself, here is Britain’s political opposition. And it pains me that the old guard of the Labour party fail to see this. Here, the entrepreneurial energy of twenty-first century activism combines with political-party engagement to produce the compound that is Corbyn’s Left. Trade unions sit comfortably within this configuration, part of a worldview where every worker, here or elsewhere, is treated fairly, complimented by a concept of ethical consumerism that drives this. Climate change is no metropolitan indulgence in this political context. It is a natural extension of our belief in the power of collective solutions for all life because that is what will feed us, body and soul, in the end. This is not the world of Millennium Goals or UN Charters for Universal Peace. It is practical, civil society engagement responding to the issues that our fellow British subjects face and who, until now, have found little voice in parliament. Labour Party membership has increased three-fold since Corbyn stood for leader. Faith in him is faith in Labour’s chances. But this merger will not last forever. Just as through his megaphone, the passionate young Liverpudlian reminded us of Labour’s pioneering social project in 1945, and just as the answer back in 1945 was to collectively come together to support each other, so might this be our solution now. But what was achieved in 1945 with pen, paper and the telegraph will now be done through web connections, apps and social networks. Momentum exists to discover and to disseminate these innovations and, at this defining moment in the history of our country, we have a treasured opportunity to use them. Already they have bonded activist youth networks together with traditional working class communities, the might of our trade unions with the imagination of our artists and the business minds who believe in the power of individuals to influence through consumer choice. What winning formula! What an opportunity! Life is turbulent for Momentum right now. Members of anachronistic left-wing factions are playing power games and its future is uncertain. During my time there, I never once saw trace of hard left thinking, bar the occasional email signed off ‘Solidarity’ usually twinned with ‘and best wishes’ or in my case, ‘and One Love’. But even if Momentum’s founders fail to steer a course around this iceberg, the network will live on. My local Momentum group in Kensington and Chelsea has just re-formed and will campaign to protect our diminishing community spaces and the Notting Hill Carnival, which is under threat. Of all the filmmakers who I worked with, campaigners, musicians, Momentum members, activists, artists, not one was calling for violent revolution of the Marxist-Trotskyist kind. These people wanted something much more simple: a Labour government that represents their values and will fight for policies they believe in. And right now, Corbyn is their guy. So let’s stop posturing and squabbling, and start riding this gigantic tidal wave of electoral potential. Labour is perfectly placed to be the political party of Britain’s future. Victory is within our grasp. Let’s take it.